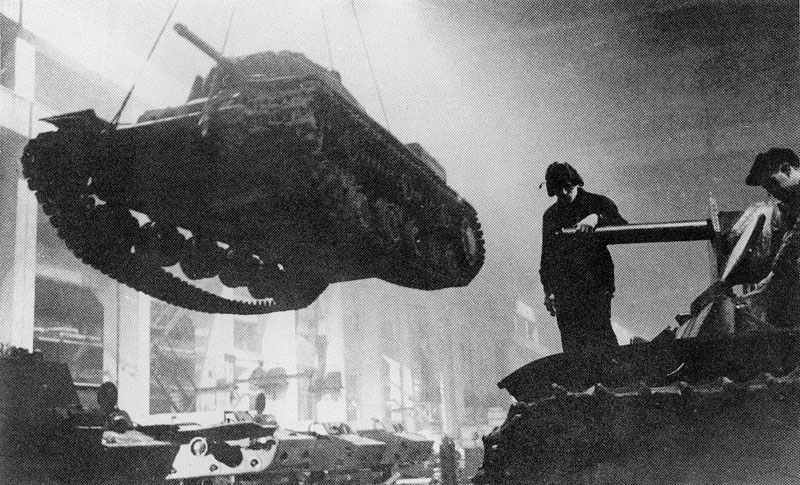 Production of Russian KV-1 in a tank factory at Leningrad. Comparison of military expenditures, distribution of vital strategic raw materials, oil and fuel production in World War II. Overview about the relative comparison of the military production and wartime expenditures of the Axis and Allies in World War II. 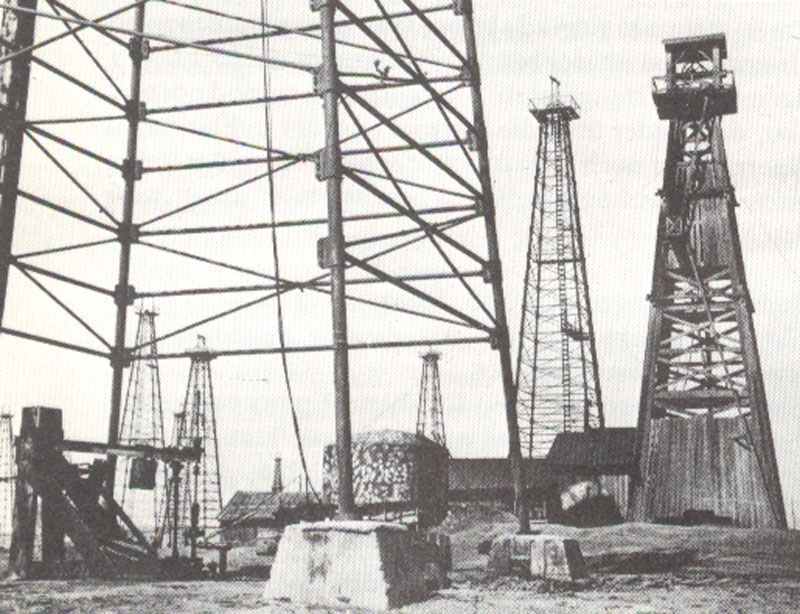 The most important German oil resources were the Ploesti oilfields. Overview of the global production of the vital strategic raw materials, without – more or less – no modern arms industry could be possible, or at least only with great disadvantages. As well, the motorized warfare with air support and naval power is not possible without adequate fuel supplies. USSR 9.3 14.3 4.0 3.3 - 3.8 1.8 6.2 40.5 ? 1939 888 2,200 5,165 8,353 ? 1944 1,681 3,962 961 6,504 ? Production ? 643 889 1,370 1,788 998 ? Imports ? 78 + 275 captured 21 102 129 107 ? Production ? 1,138 1,160 1,002 1,133 935 ? Imports ? 683 + 309 captured 1,124 1,021 804 542 ? Consumption ? 1,811 2,504 2,089 2,101 1,805 ? Production ? 781 1,114 1,285 1,358 889 ? Imports ? 501 + 200 captured 612 208 435 371 ? Consumption ? 1,335 1,856 1,519 1,744 1,435 ? Hi. This data is VERY interesting. Well done collecting it! But i have a doubt: I had understanded that Germany faced an Oil crisis already in 1941, whith a deficit of 26% or so, which is why it invaded the USSR. Yet your figures of “Oil and Petroleum supply of Germany in the second world war” (i do not know its sources) show that there was never such a deficit. Is that true? What are your sources for that figures? Most from World War II: A Statistical Survey: The Essential Facts and Figures for All the Combatants, the bookw hich I just have included below the headline ‘Strategic raw materials ‘. I see. So in your view (or that of the book, at least), Germany did not had an oil deficit. That’s ground-breaking! almost all literature says Germany was running out of oil! I’m going to red the book. Seems interesting. Thanks for the answer. There wasn’t any real breaking for the war effort because of oil shortage until the last stage of the war (bombing of the synthetic oil industry). Caucausus oil fields or build-up of synthetic oil industry after failing to capture it was enough for the German armed forces until it was bombed in mid-1944. And following that line of thinking, do you believe Germany could win over the USSR in 1942? People think that by then (after 1941) it was doomed in the east. What do you think of this? Of course i’m not talking about germany defeating the USSR IN 1942. I’m asking if Germany, in 1942, in your view, could still eventually win in the eastern front, or if it was already doomed after the defeat in Moscow. But at least in the case of the loss of the Oil fields in Caucasus, Stalingrad captured an hold by the Axis which would have cut Lend-Lease Supplies to Iran, everything could have be possible. Soviets were short of steel, oil, food an everything else at this time and much of it was delivered by the Western Allies during this time (see Arctic convoy ship loads). But to defeat ore at least come to a truce with UK and US (with an Atomic bomb in 1945, even with German ‘Tabun’) is very questionable, isn’t it ? I believe that you guys are drawing incorrect conclusions from this data. Drawing attention to the aviation petroleum, motor petroleum and diesel stockpile statistics. From 1941 on wards, there is a clear trend that Germany was eating into it’s oil stockpiles, and if you were to subtract the amount of captured oil (unsustainable acquisition of oil from then on wards), you will see a downward trend in oil stocks. Although they may have still had SOME left over for a while, this was not going to last. On top of this, these reserves would likely have dwindled as time went on. Time Germany certainly did NOT have.